My 3 year old daughter Lilyana is Wonder Woman this year for Halloween. The costume is not a packaged costume but is put together from items purchased mainly from Etsy & Ebay. I purchased a red leotard and added a Wonder Woman appliqué to the front. The shorts were purchased through a gymnastics site. Her cape, headband, arm bands, and lasso of truth were purchased on Etsy. She already had her black boots and the socks were purchased at a Halloween store. They are adult socks, we just folded them at the toe. 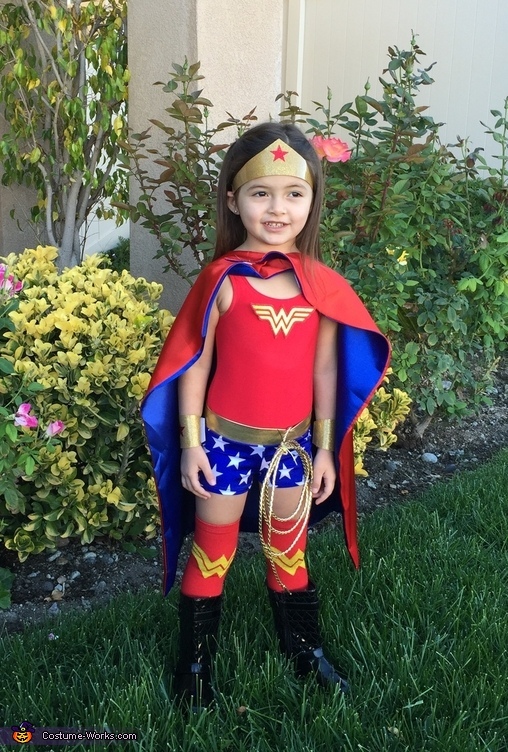 She picked the costume because she loves the book " My First Book of Girl Power", and in the book Wonder Woman talk about her Lasso of Truth and why it's important to tell the truth. The costume put together was about $120.